Oh, Friends, you know how much I love a good sweet treat. The best part of these as that they're grain-free and that they contain a low-glycemic sweetener but they still taste amazing! I can't wait to hear how much you love these, they're very allergy friendly so a great treat to bring with you to "get togethers". -Mix melted coconut oil, coconut sugar, almond butter, egg, and vanilla in a small bowl with kitchen-aid or hand mixer. Mix well. -Combine almond flour, baking powder, baking soda and salt in a medium bowl and mix together well with a fork. -Pour dry ingredients into wet ingredients and mix well with the mixer. 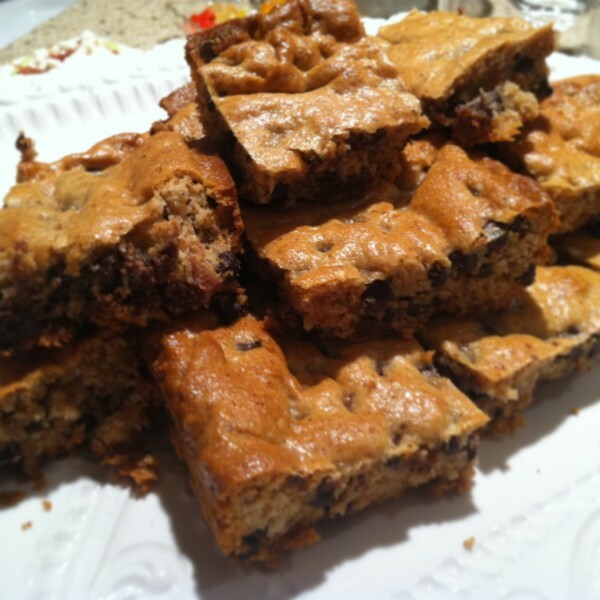 -Mix in your choice of chocolate chips/chunks and spread batter in greased pan (grease with coconut oil). -Bake at 350 degrees for 15-20 minutes or until toothpick comes out of center clean. Edges will start to turn golden brown.